So you have finally bought your dream car. Now you need to make sure that your garage looks as great as your car when your friends come over to check out your car. Or maybe you’re building your dream man cave! One of the best options on the market to improve the look of your garage is using roll out vinyl garage flooring. When you are considering options like epoxy and paint, a roll-out vinyl garage floor roll is an excellent alternative. 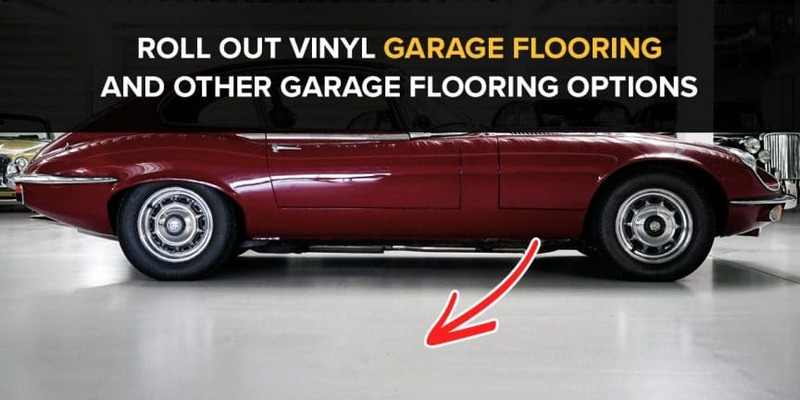 The biggest advantage of roll-out vinyl garage flooring is that it is easy to maintain, and that you can install it on your own without any hassle. Roll out vinyl garage floors also come in a variety of patterns and colors. You can either use the roll as complete flooring or only as a garage mat as it comes in various sizes. You don’t have to worry about the damp weather as most vinyl rolls on the market are mildew and mold resistant. Vinyl garage rolls are tough and durable. When you are working in your garage with tools and when you drive your car into the garage, you won’t have to worry that the roll may tear. Let us start by saying that epoxy and garage floor paint are both good options when it comes to your garage floor. Each has its pros and cons. You have to decide which option is best for you. Many people say that when you do an excellent job of preparation and then add a thick coat of garage paint to the floor, your job is done. Others say that having high-quality epoxy products is the answer. Both are good solutions but you have to decide what the best solution is for you and your garage. Do you want something cheap and easy to do which you can do on your own? Do you want something that will last for a long time? Do you move houses every few years, or do you see yourself spending the rest of your life in this house? Painting your garage is simple and easy. You just need a good power wash and then you can allow a day for the floor to dry up. You then can just roll out the floor concrete paint. You will get a perfect finish which will hide any stain or imperfection. This is an inexpensive option and you can do it on your own. The only disadvantage is that it will have a very short lifespan when you compare it with epoxy. Even paint manufacturers who claim that they have epoxy paint, can’t give you a product which will compare to a real epoxy floor. If you want to coat your floor with an epoxy coating system you will need to spend more as it is a more complex process. You will need a prep stage; the epoxy is coated in two rounds, broadcast material and finally a couple of coats of finish. It generally takes a couple of days and it is better if you contract the job to a professional for the work. The advantage of Epoxy is that the finish is excellent and will last for a lifetime. Since there has been a lot of advancement in epoxy technology over the last decade, epoxy is one of the most durable coating materials in the world. With an epoxy floor, you won’t have to worry about heavy traffic, the weight of your vehicle and weight of machinery on the floor. An epoxy floor is non-porous so it will repel paint and oil, brake fluid, grease, etc. In short, epoxy flooring is pretty badass. Regardless of if you are doing it on your own or if you’ll have a contractor do it, the material cost will be the same. And that will be a major cost when it comes to your final price. Labor costs if contracting out, will have to be factored in as well. In addition to material and labor costs, there are many other factors like the size of your garage, the number of coats you plan to apply, if you want to fully cover the floor of your garage, etc. You also need to keep in mind that you will need additional items like primers and sealants. You will also need tools like tape, sanders, and brushes. You may have to spend a few hundred dollars on tool rental (or purchase), so keep this in mind as well. As per DIYorNot, your cost on an average to do it yourself will be $150 and if you will have a contractor do it, the average price will be $435 for a standard sized garage. The price will change as per your location, garage size, and material used. Having snap together garage tile flooring is a mid-way solution between painting your garage and setting up an epoxy floor. It will last much longer than painting your garage floor, and the end result looks great. If you have the budget, you can employ a contractor to set it up for you. If you don’t have the budget for that, it’s easy to install, so you can do it on your own. Garage tiles come in standard sizes which range from 12×12” to 24×24”. They just snap together and are easy to install and remove. You can also create interesting patterns on your floor with it. You can install it directly over your floor even if it is cracked. The only major issue with garage floor tiles is that it is costlier than either garage floor paint and garage floor epoxy, but since it is easy and quick to install, and looks great, many people opt for it. TrueLock Diamond HD Garage Floor Tiles comes in a pack of 40 tiles which is 12 inches by 12 inches by 0.5 inches thick. It is made of alloy. It will cover a 40 Sq. Ft. area. The tiles are made in America and have a 10-year warranty. You get two ramp edges for free for your garage door. In case you need more than two, you can buy them separately. They are sold via Garage Flooring LLC. It has an excellent design and is very durable. TrueLock HD is a premier Diamond tile which is tire-resistant, stain resistant, and chemical resistant. You can mix and match the tiles if desired, so you can make a unique design pattern if you wish. As you can see, there are various options when it comes to deciding on the best garage flooring. If you want a garage floor that is easy, DIY, and inexpensive, you can paint your garage floor. If you want a solution that will last a lifetime and don’t want to spend too much, you can go for an Epoxy solution. If you want a solution that is easy to set up and is attractive, you can opt for floor tiles or roll out vinyl garage flooring. As always, comment below if you have any tips or would like to show off your own garage floor!